In honor of our recent coyote visitors in New York City, here are a few images and songs inspired by urban coyotes. Beautiful, no? This print was made by Atty Gell, an artist who lives near Trout Lake Park in East Vancouver, Canada. Coyotes are not infrequently spotted passing through the park and the neighborhood. 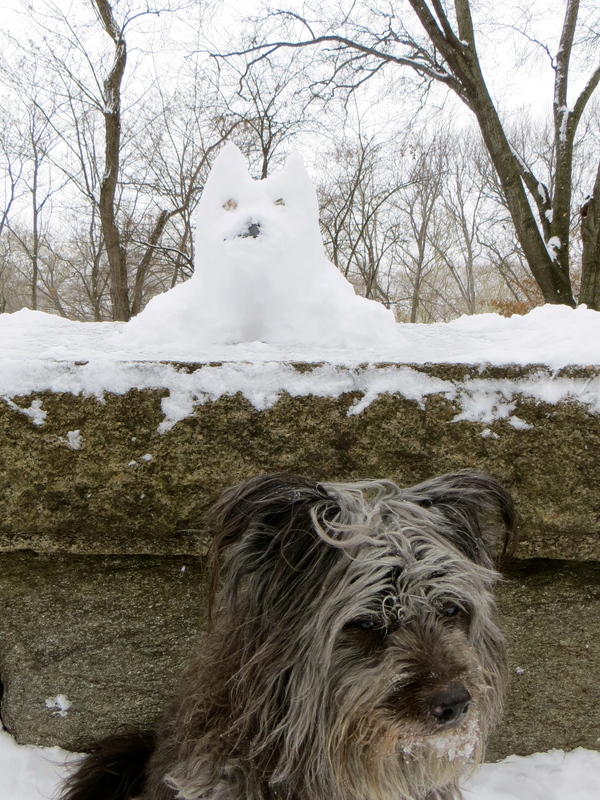 When I was working on my play, NYC Coyote Existential, I asked Atty to create some coyote images for me to use for publicity purposes. She sent these lovelies. For poetry, listen to Tim Seibles read his poem: Midnight, the Coyote, Down at the Mouth. 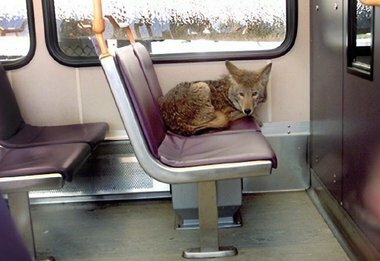 For music, try this music video of Coyotes by Modest Mouse, inspired by an incident in 2002 when a coyote was spotted riding light rail in Portland, Oregon. 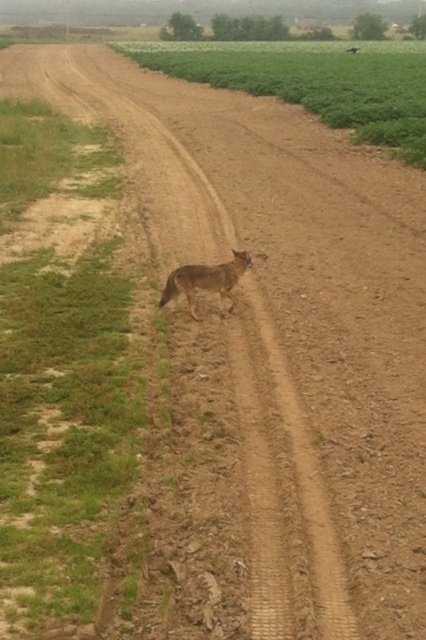 Don’t know what well-trained coyote played the role, but here’s a photo of the actual wild coyote, looking no more harried than any other habitual commuter on a bad day. And if you need to bang your head a bit (and as evidence that the urban coyote has been around and has legs, as it were), here is Coping with the Urban Coyote, Unida’s 1999 album. Love that cover art. 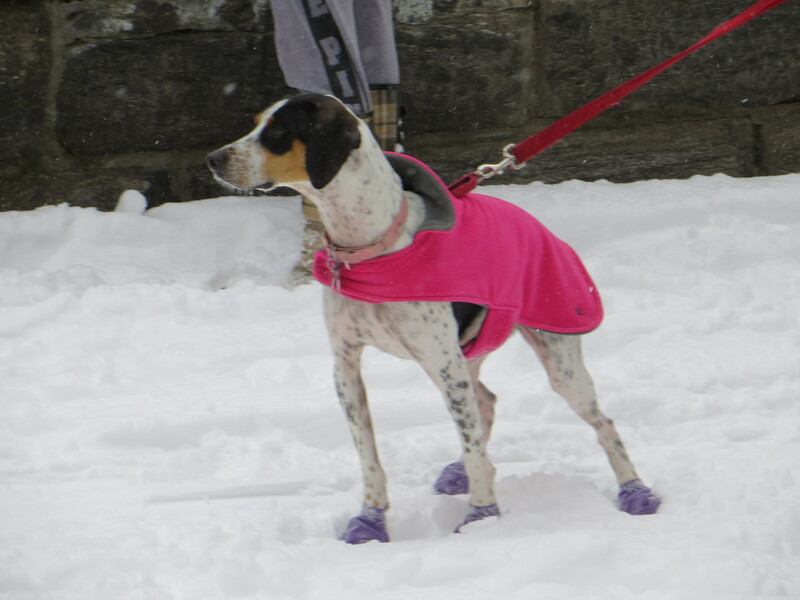 Dog with unfortunate sense of style. I know how bad the storm is for people to our east, west and north. 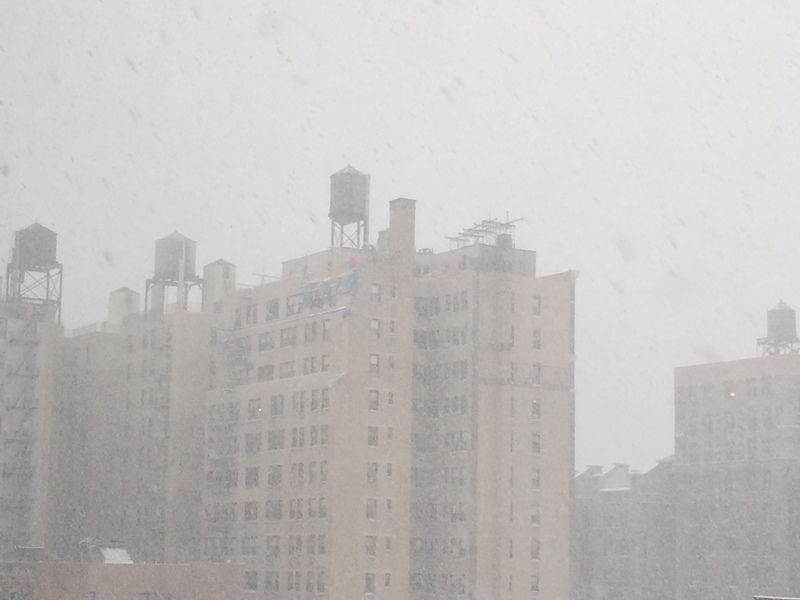 But if there was a blizzard here in Manhattan, I missed it. 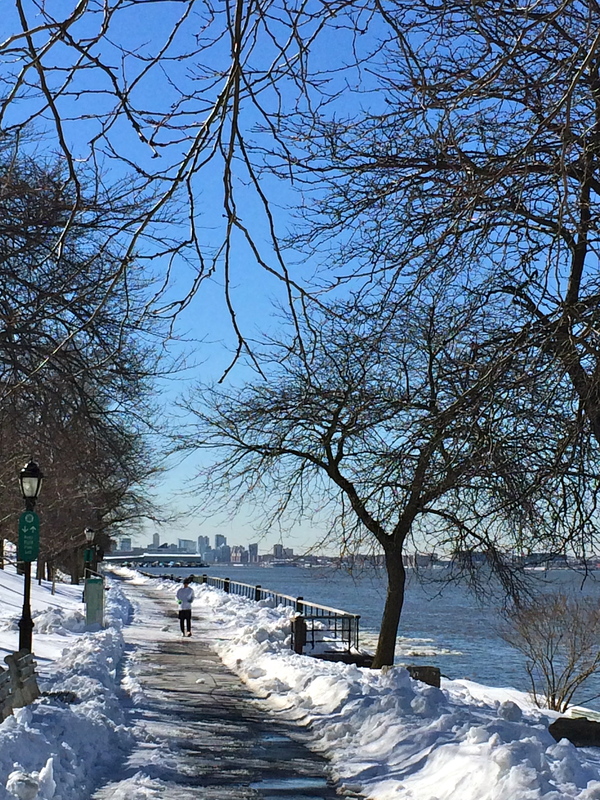 By 6 PM, all city parks were officially closed. The subways started shutting down at 7 PM. At 11 PM, all mass transit and all roads were closed. – Wait, did you say the parks closed at six? – Don’t worry about it. 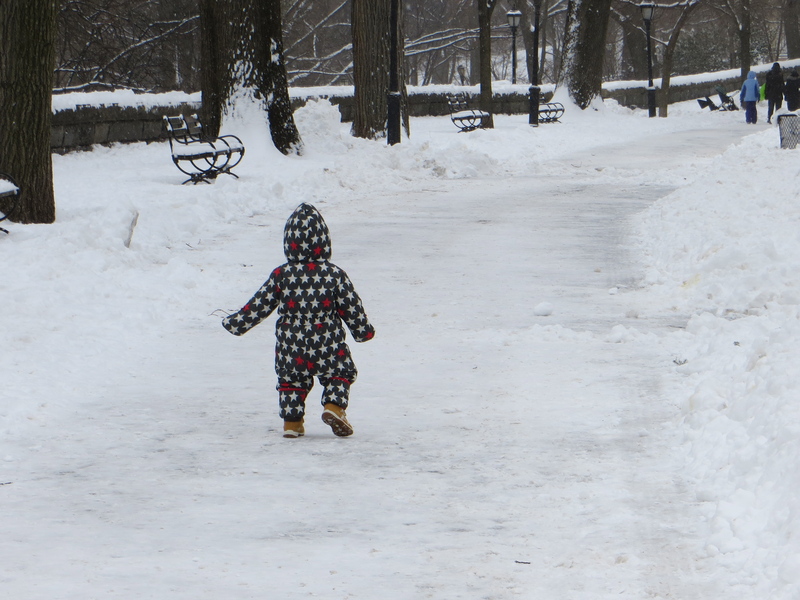 Because this is New York, baby, and this is what a closed park looks like. 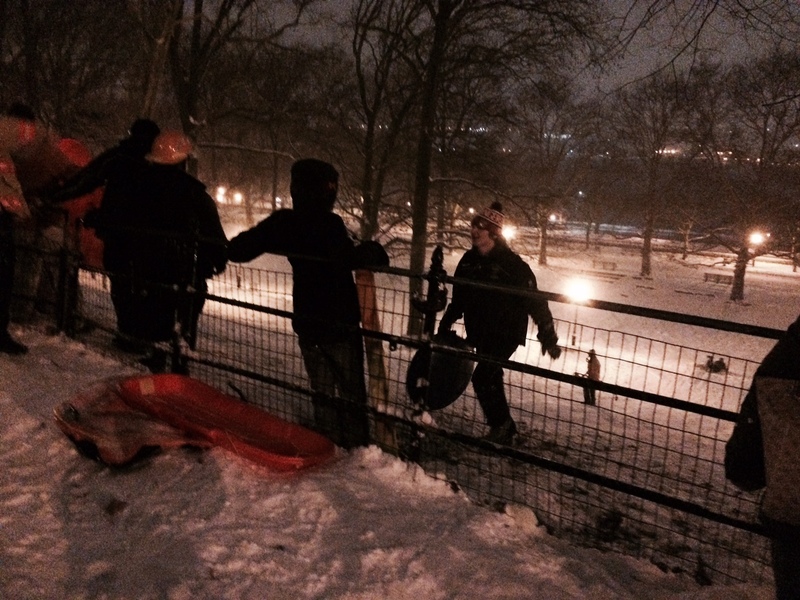 Night sledding in Riverside Park! Woot woot! 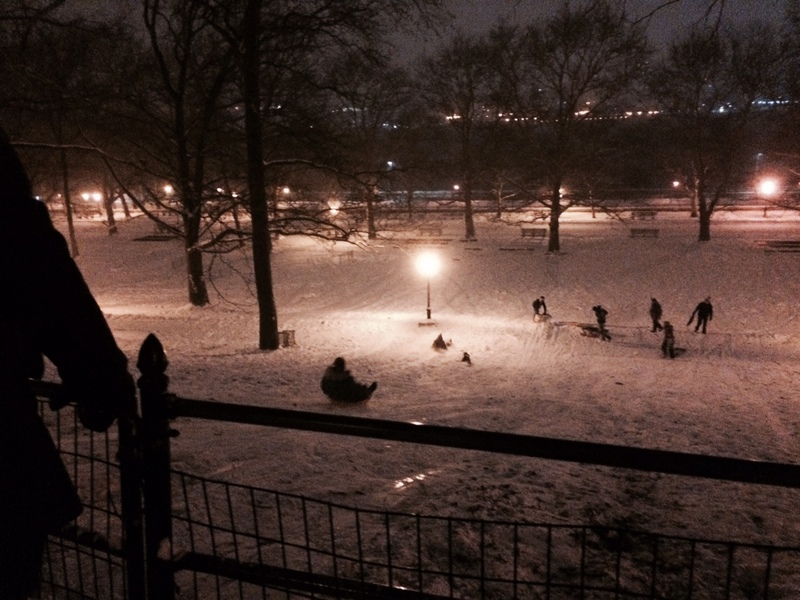 You can’t tame the night sledders. Not in New York. Only the wildlife took the closing seriously. 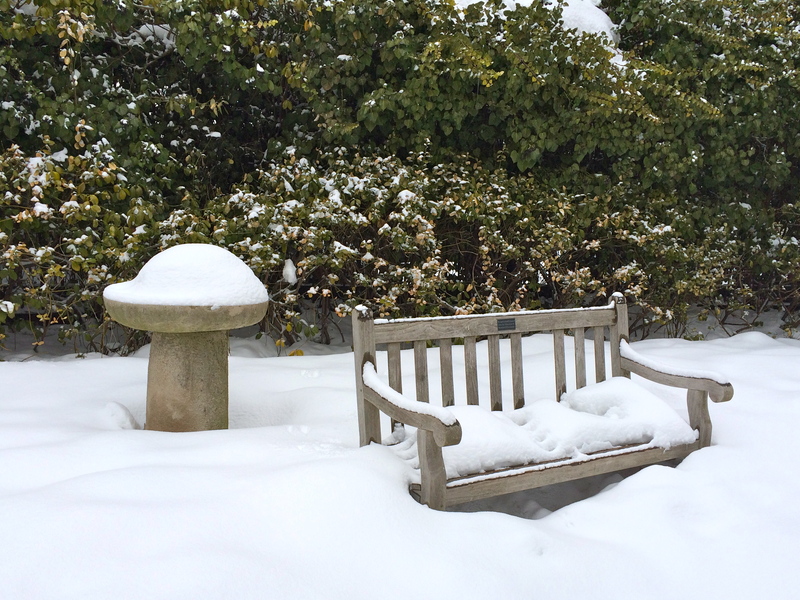 The raccoons were nestled all snug in their snow-frosted den. 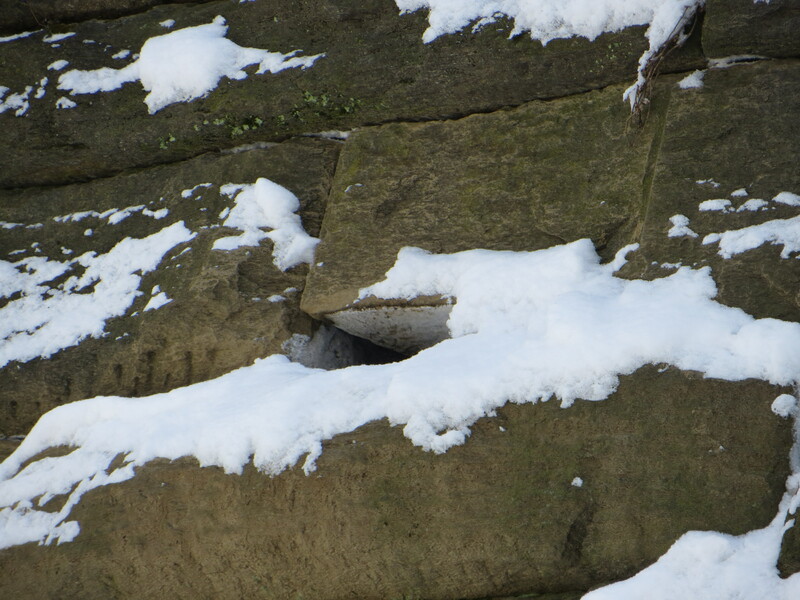 Raccoons who live in the wall were wearing fur slippers, drinking cocoa and watching the weather on NY1. All night and this morning, the city was eerily, wonderfully quiet. And the streets remarkably clear, thanks to the snowplows that had free rein of the streets all night. 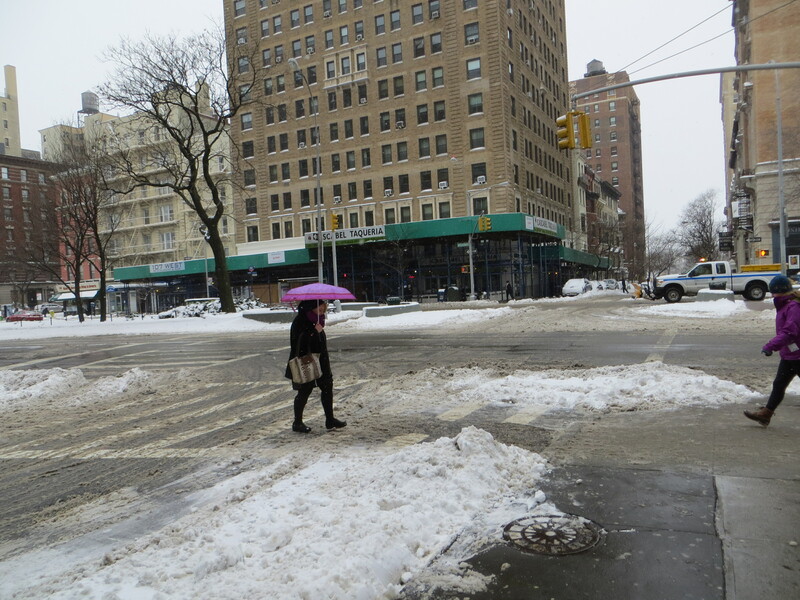 Broadway this morning, light snow coming down. 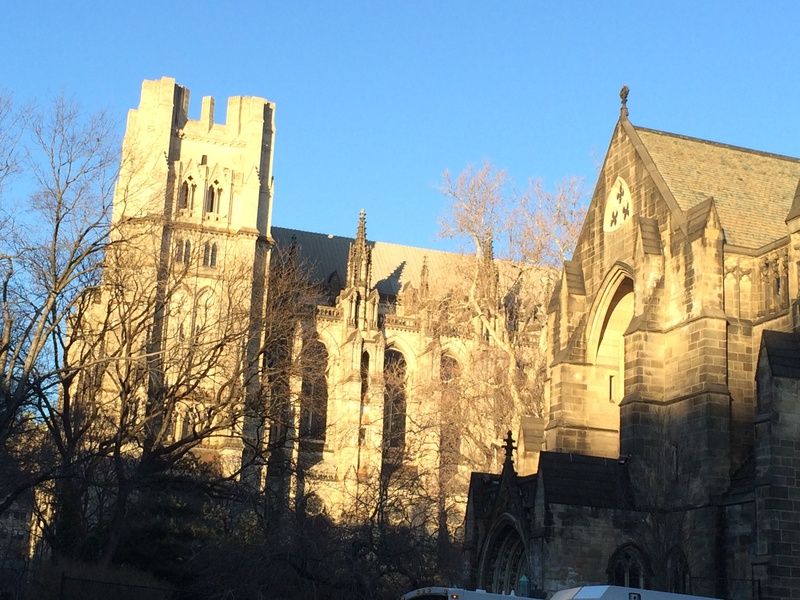 The ever-present city hum was almost imperceptible, and even now, late in the afternoon, it’s unusually quiet. Although not in the parks. 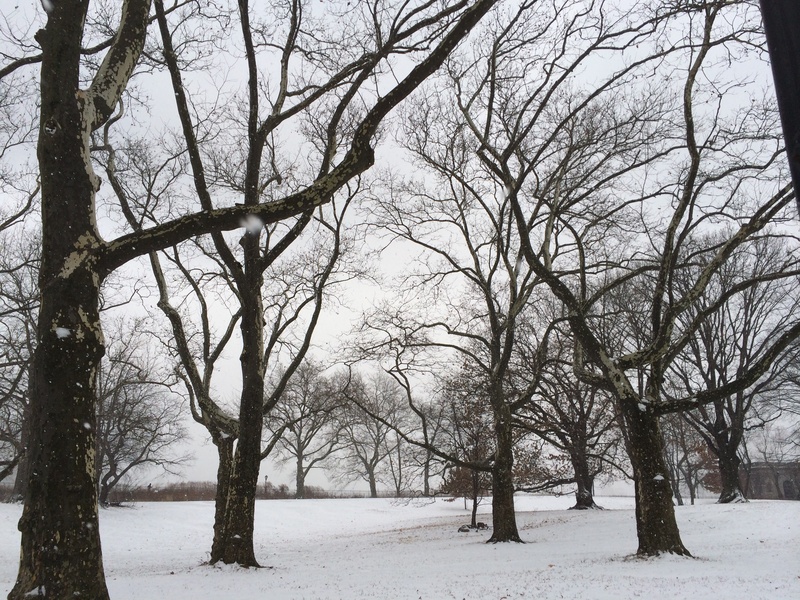 The parks, with their five or six inches of fresh snow (a bit short of the predicted two feet), are bustling. 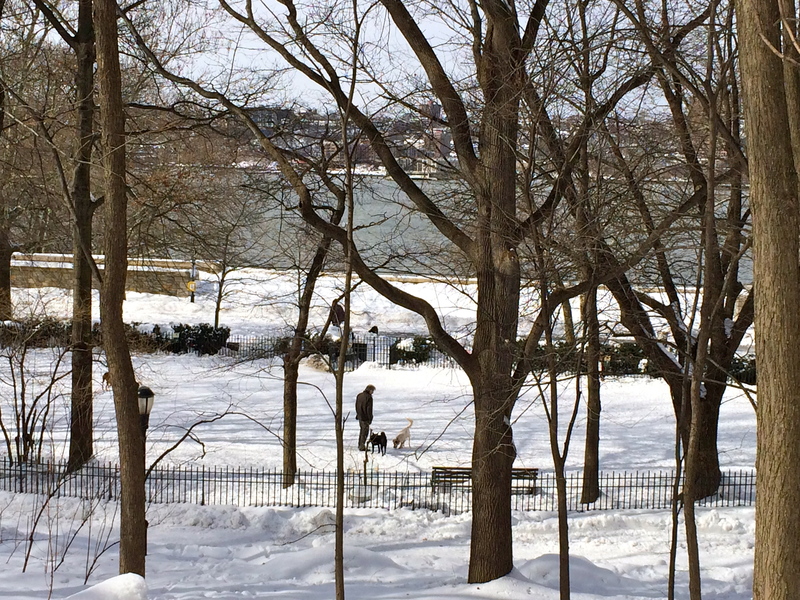 Sledding in Riverside Park – looks like a Currier & Ives. 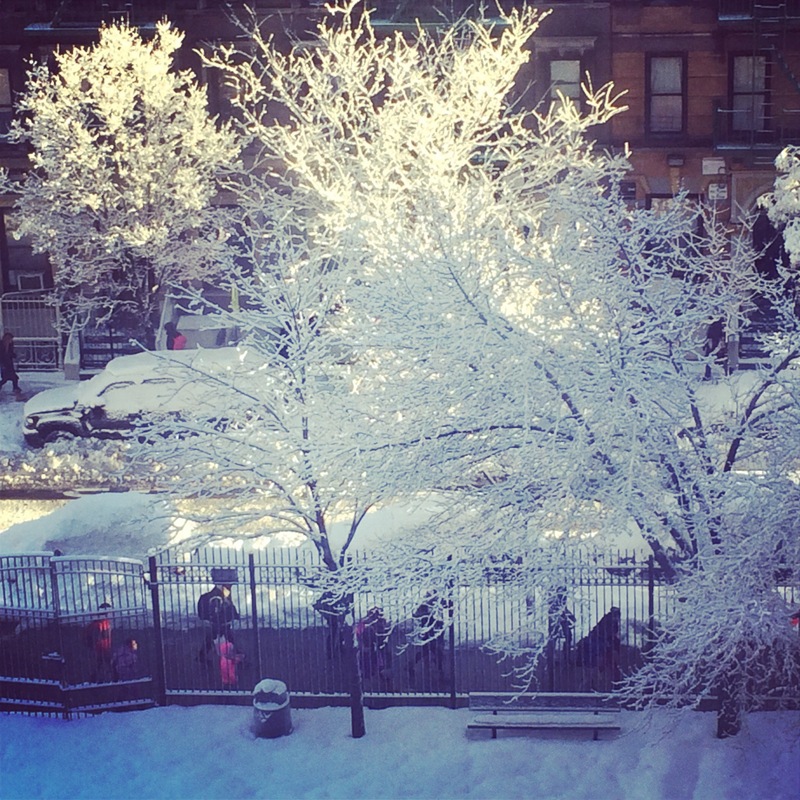 Everywhere are walkers, sledders, little kids in snowsuits, dogs in boots, and parents hauling children in sleds. 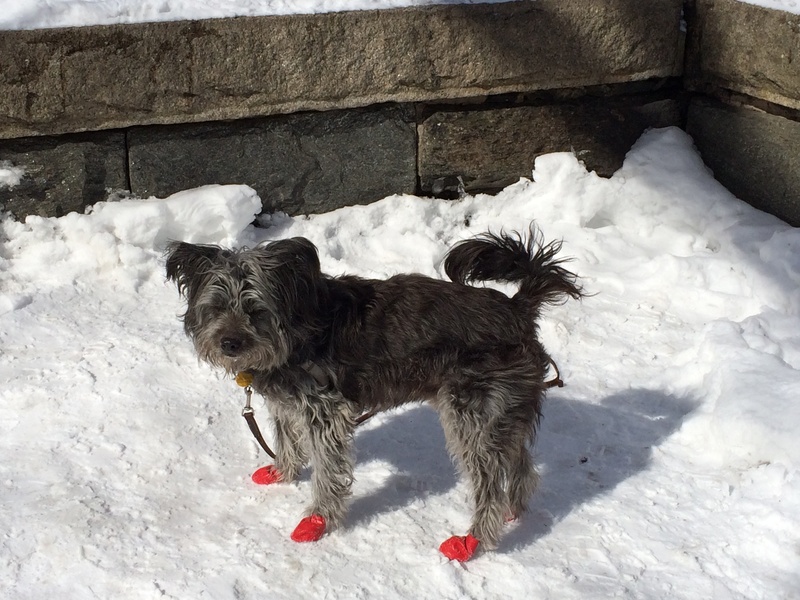 Last but definitely not least, here is an adorable little man in brand new boots, enjoying his first big snow. Little man on a mission. 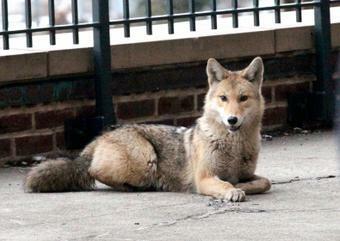 Another coyote was caught in Manhattan, this time in Stuyvesant Town, just north of the East Village. 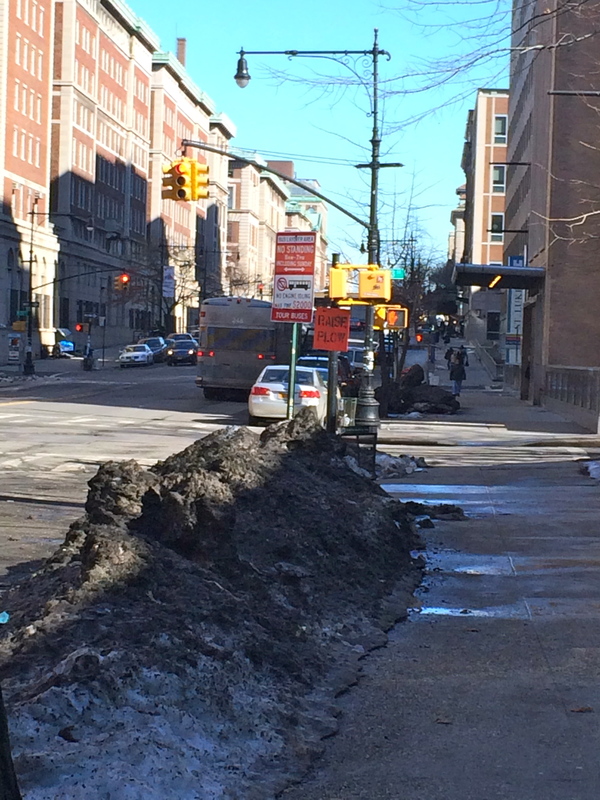 Are other coyotes roaming Manhattan even as you read this? Hard to say. But if they’re not here now, they’ll be back. Long Island potato fields, Bronx wilderness areas, Staten Island garbage dumps, and the endless graveyards of Queens are one thing. 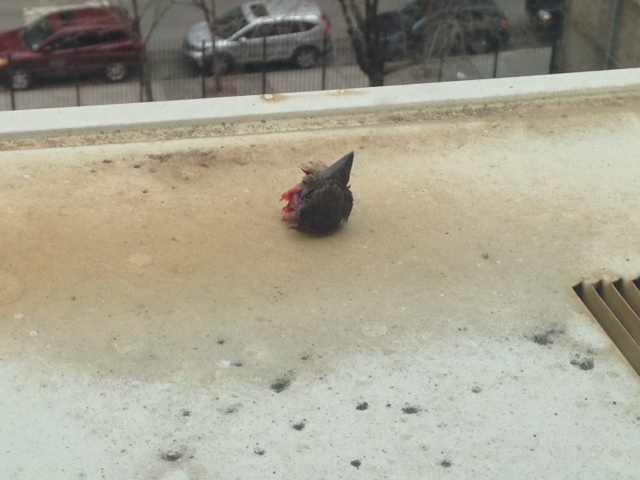 Manhattan is another. I mean, let’s face it, the city’s unlikely to let a wild dog run free all over our nice street grid. 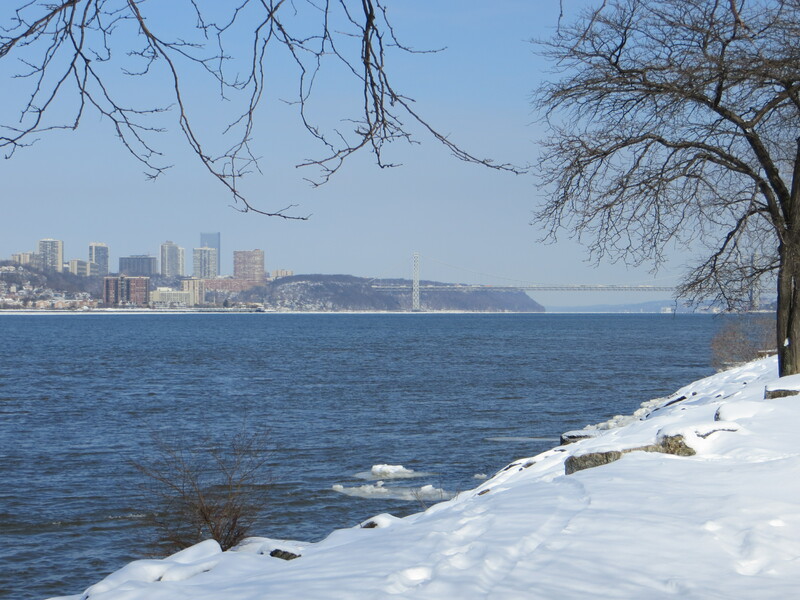 I’m skeptical that coyotes will be able to establish themselves in Manhattan, unless they were to stay within the boundaries of a large park, say, Inwood Park up at the tip of the island. 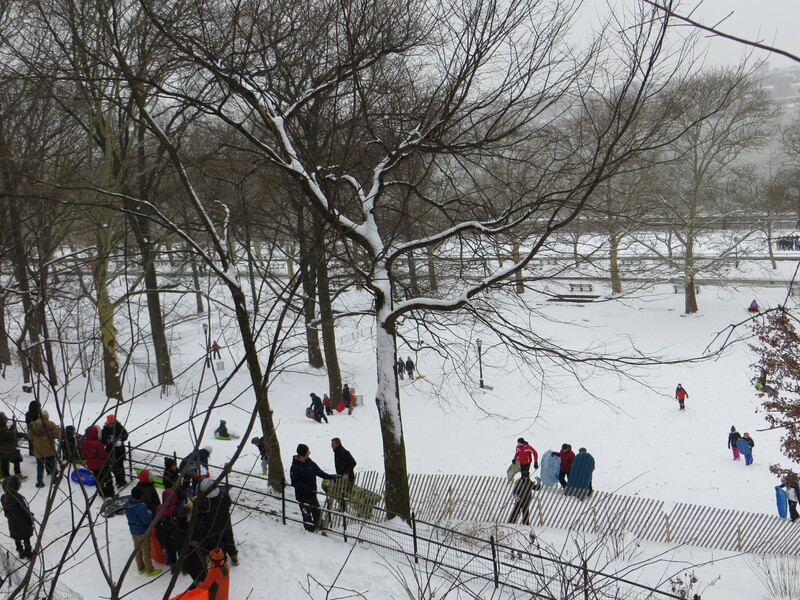 They’ve already tried Central Park in 1999, 2006 and 2010. Watching her in the night park as she stepped out onto the ice of the frozen Pond, or trotted up an empty path was a thrilling experience. 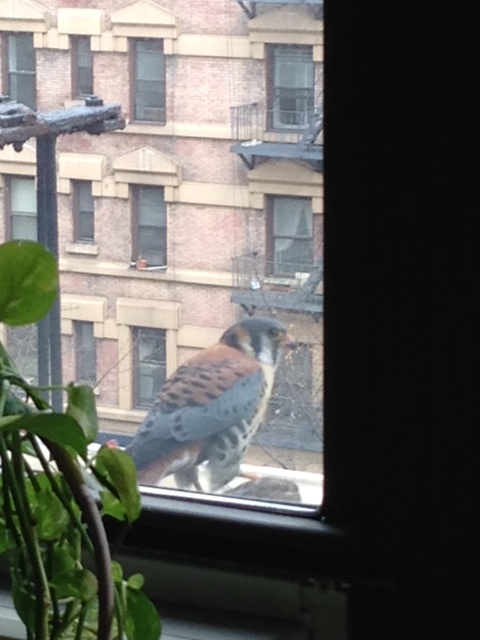 It inspired me to write a play, NYC Coyote Existential. 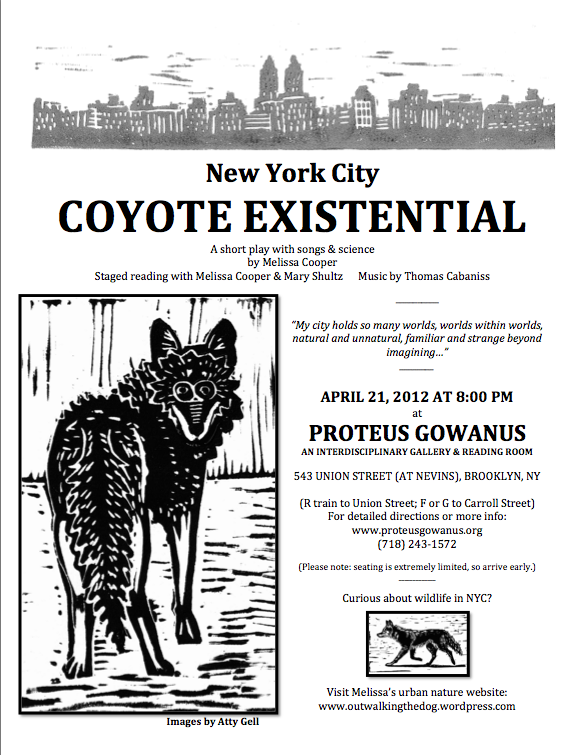 NYC Coyote Existential, staged reading at Proteus Gowanus Gallery in Brooklyn, April, 2012..
Could be it’s time to mount a production right here in the city. Photo by Christopher Sadowski. 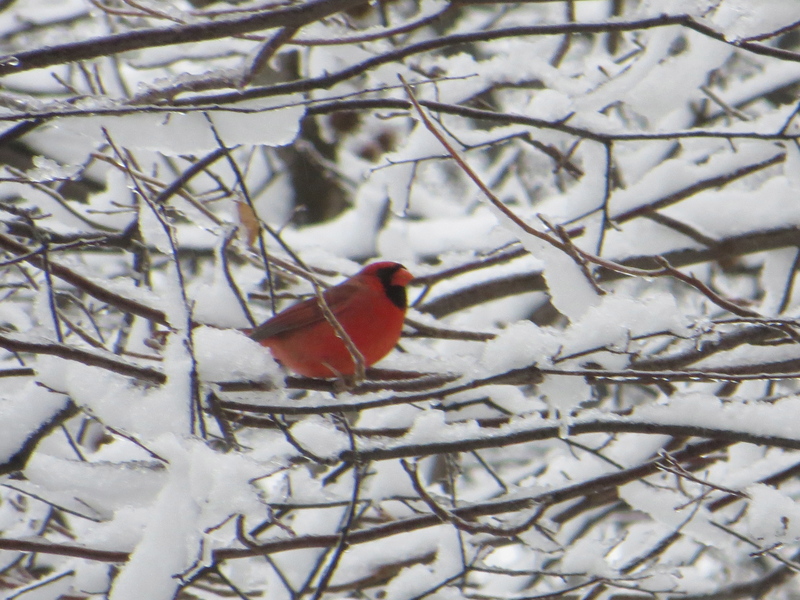 Visit The New York Post for more of Mr. Sadowski’s photos. 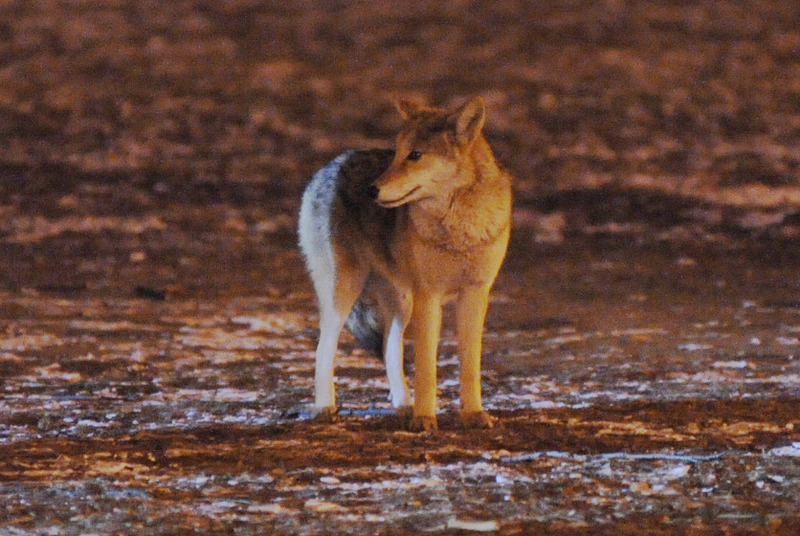 Last night in Manhattan’s Riverside Park, a coyote was captured by the police. As far as I can tell, this is the first coyote sighting in Manhattan since March 2010 when a beautiful young coyote spent about a month in the city. 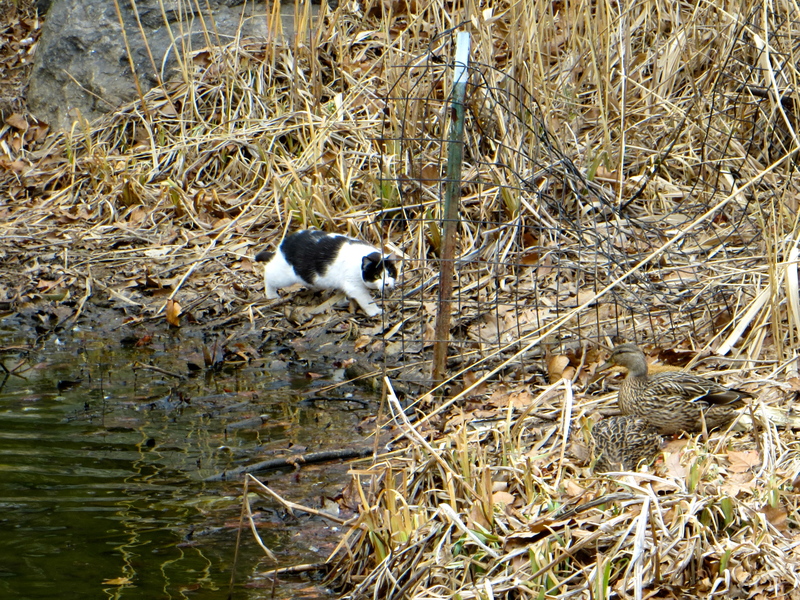 She quickly found her way to Central Park’s Hallett Nature Sanctuary and made her base in that protected acre in the shadow of the Plaza Hotel before being captured down in Tribeca. 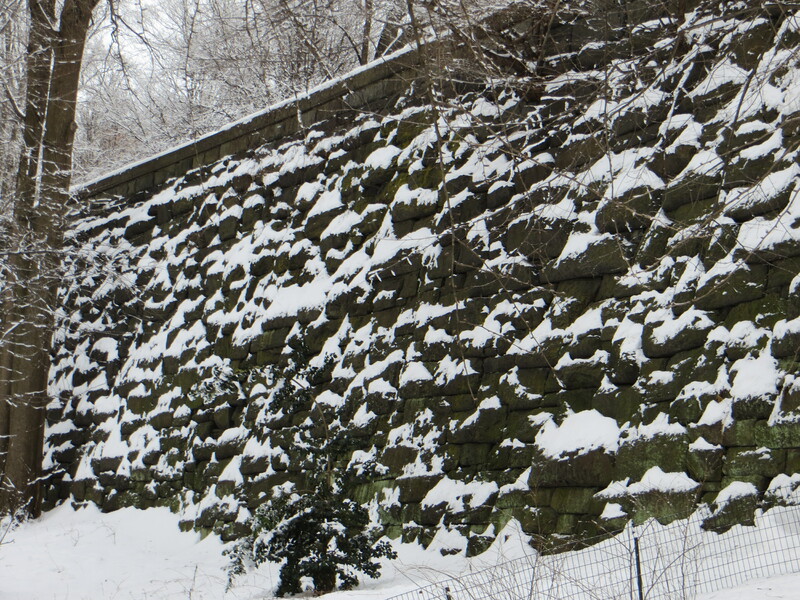 In 2012, coyote tracks were found in Fort Tryon Park in Washington Heights in northern Manhattan, but I can find no report of a sighting. 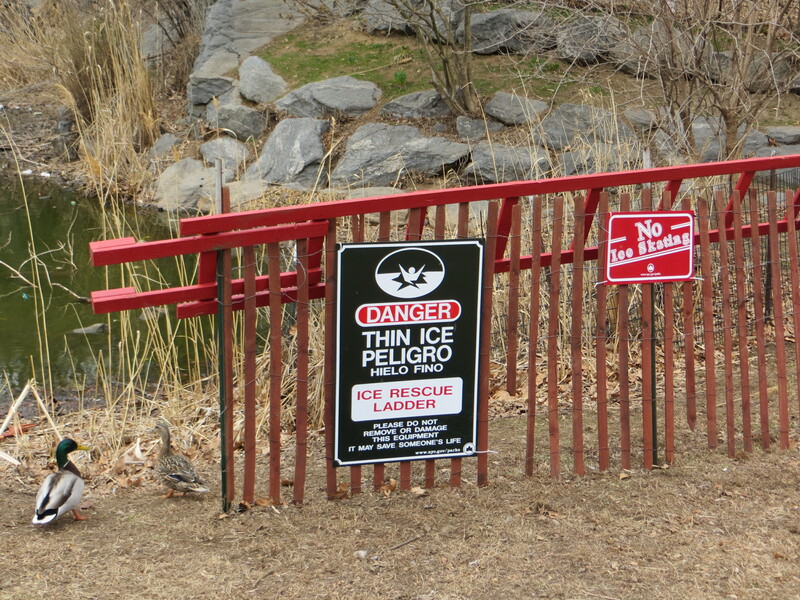 Coyotes have been resident in the Bronx for some time now. 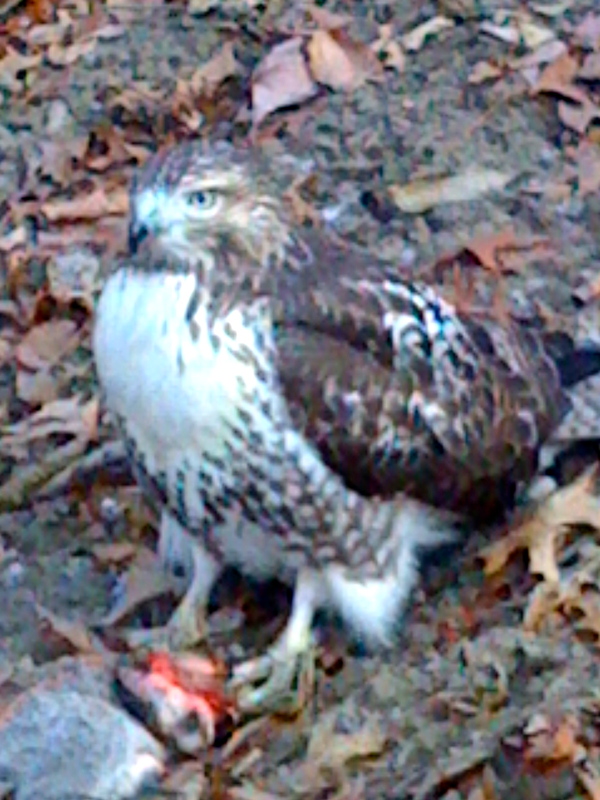 More recently, they seem to have taken up residence in Queens, and in 2012, a coyote was spotted in Staten Island. 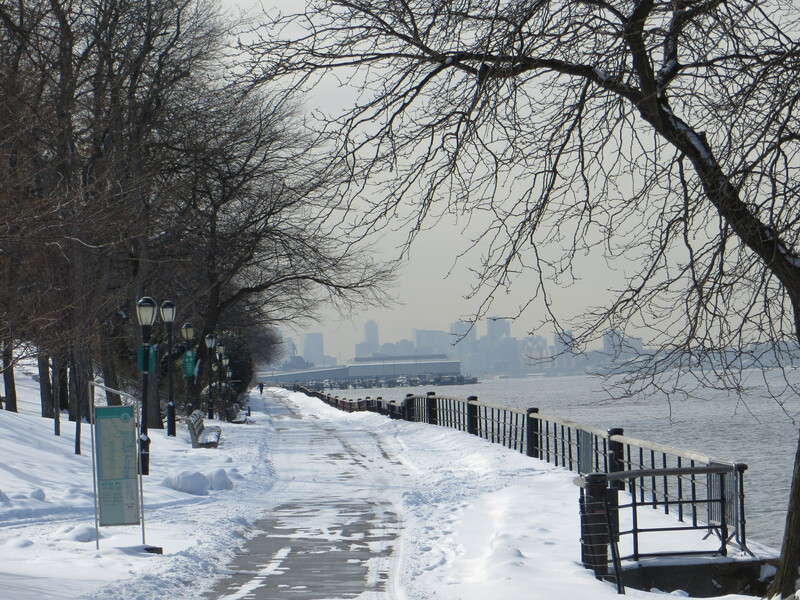 Manhattan’s coyotes probably come down from the Bronx over one of the bridges at the northern tip of the island or, possibly, by swimming. Wildlife biologists at the Gotham Coyote Project are currently studying our coyote population, using camera traps to answer the question: “Where in NYC and its surrounding suburbs can you find coyotes?” The Munshi-South Lab is also involved with monitoring the establishment and dispersal of coyotes in NYC. A camera trap captured this gorgeous image. 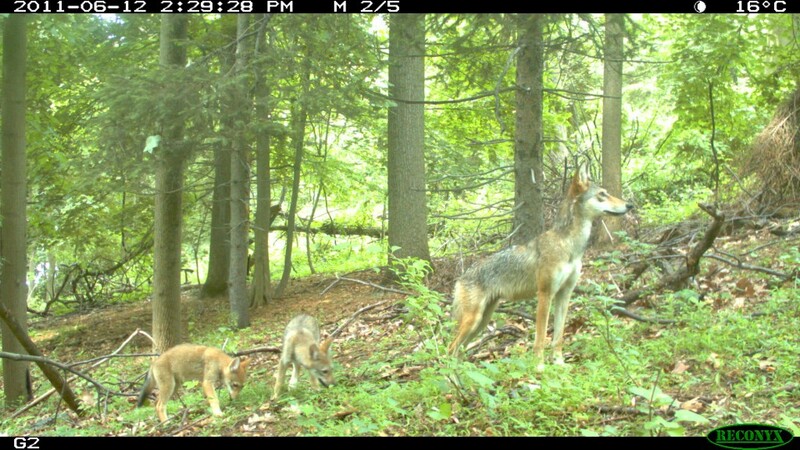 Camera Trap image of coyote and pups from the Munshi-South Lab website. Police report the animal was unharmed and was taken to Animal Care and Control where it will be examined before being released somewhere outside the city. 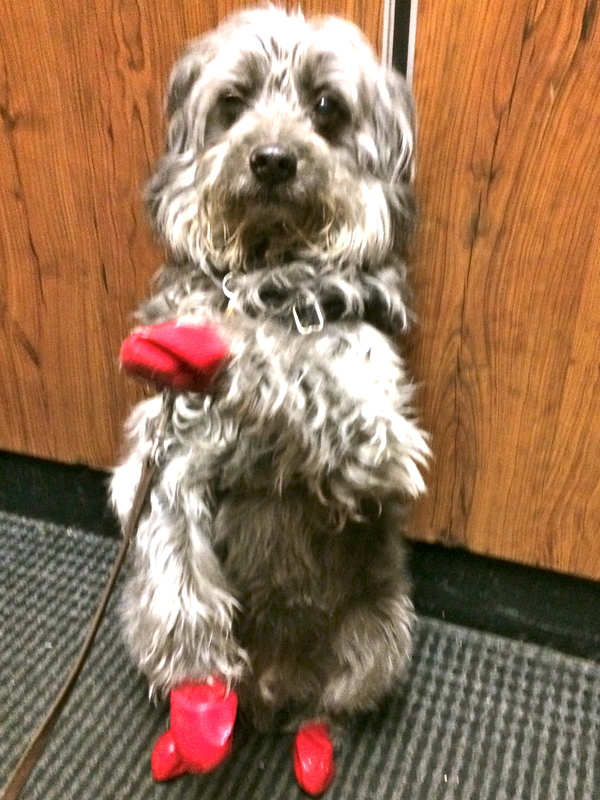 Who’s that walkin’ around here? Baby elephant patter, that’s what I calls it. 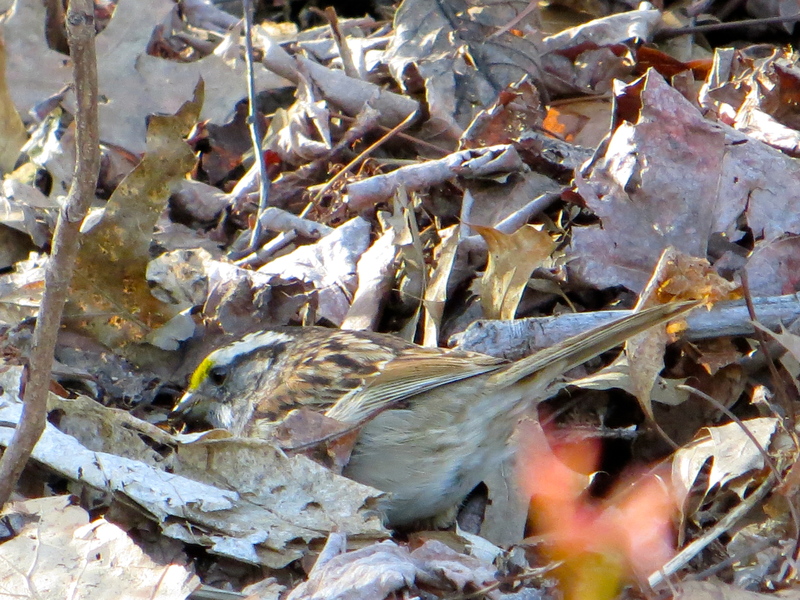 Ah, it’s a White-throated Sparrow, digging through the leaves for tasty morsels hidden below. Beautifully camouflaged in the ground litter, the sparrow nonetheless called attention to itself by kicking up an absolute ruckus. 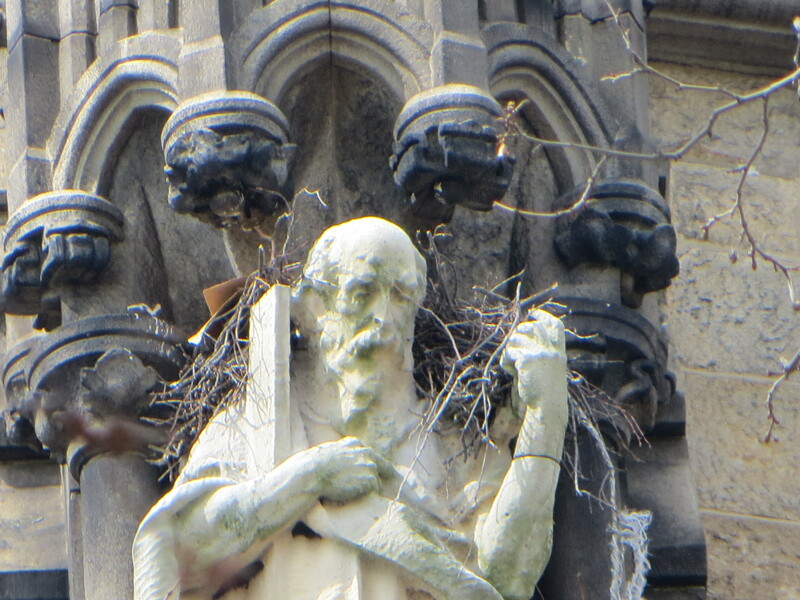 If you’ve never seen a little bird dig, it’s quite an impressive flurry of activity with wings, feet and beak all in motion at once. 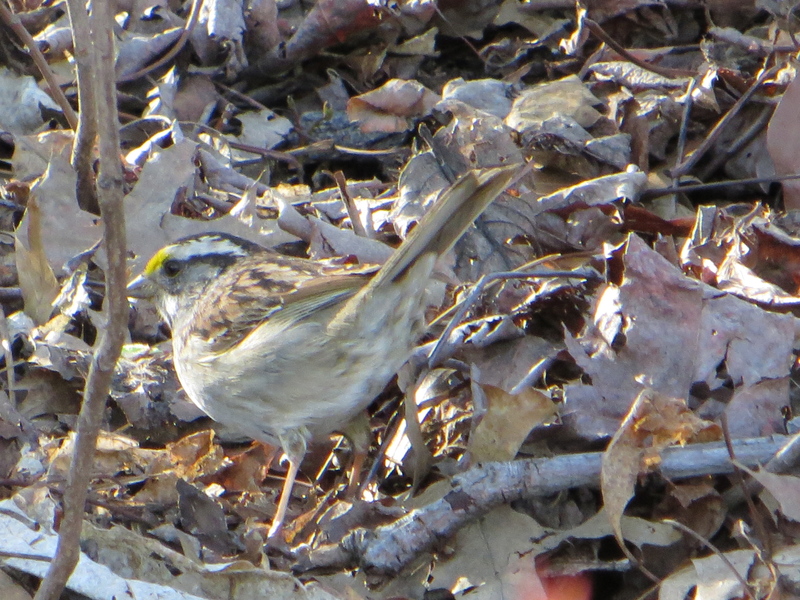 White-throated Sparrows have two color morphs, the striking white-striped bird above, and a subtler tan-striped variation. The two forms are genetically determined, and they persist because individuals almost always mate with a bird of the opposite morph. Males of both color types prefer females with white stripes, but both kinds of females prefer tan-striped males. White-striped birds are more aggressive than tan-striped ones, and white-striped females may be able to outcompete their tan-striped sisters for tan-striped males. After mating with whichever-striped chosen consort, White-throated Sparrows build their nests on or near the ground, which makes the eggs and nestlings easy prey for that most adorable of vicious predators, the Eastern chipmunk. Eastern chipmunk in Central Park. Yes, these cute little rodents don’t confine themselves to nuts and seeds. 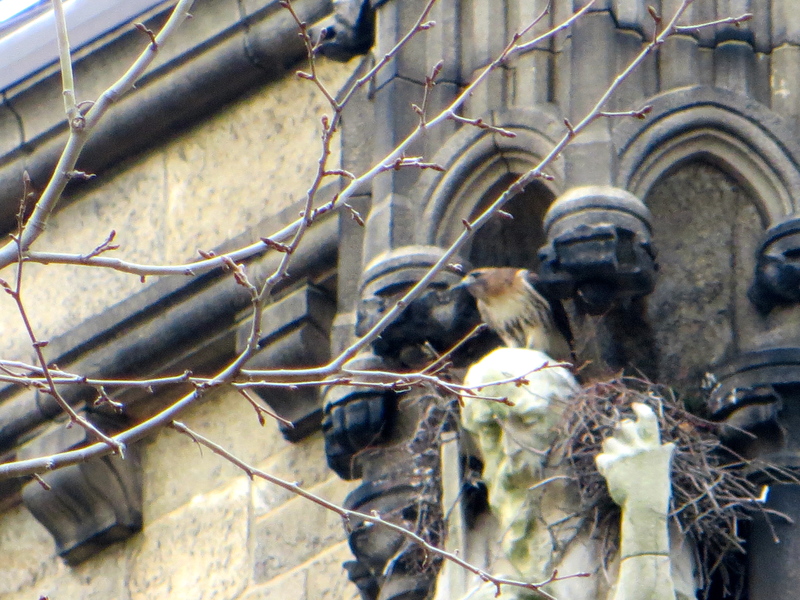 In fact, they are notorious nest-raiders of ground-nesting birds, helping themselves to a quick blast of protein in the form of eggs and babies. 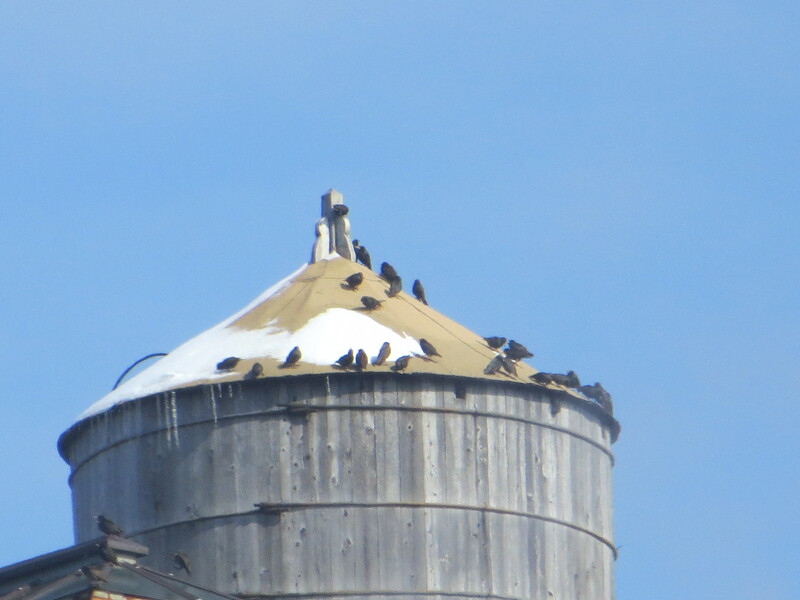 Interestingly, a 2011 study indicates that some species of ground-nesting birds, notably oven-birds and veeries, pay attention to chipmunk calls and avoid nesting in chipmunk-rich areas. 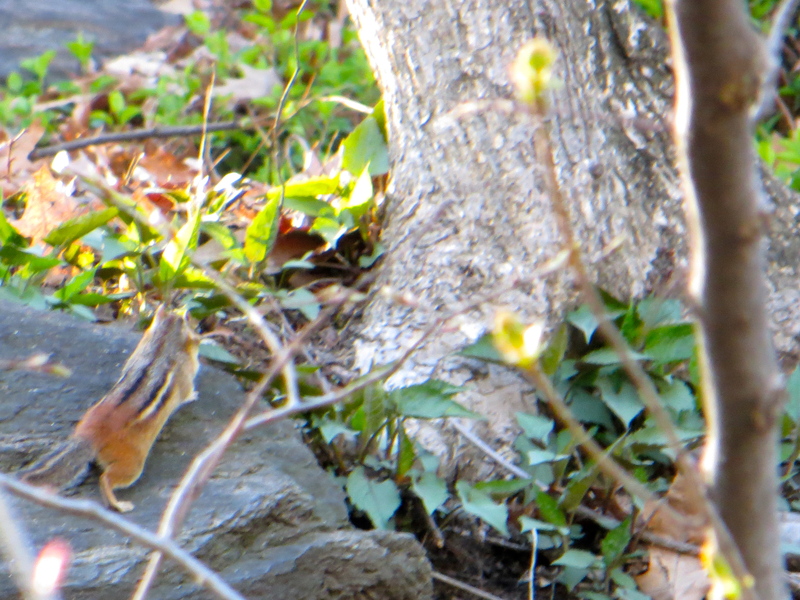 A rustle in the leaves reveals a fat-cheeked, lovely chipmunk on a hillside near Central Park’s North Woods. Check out the large nut stowed on the side. 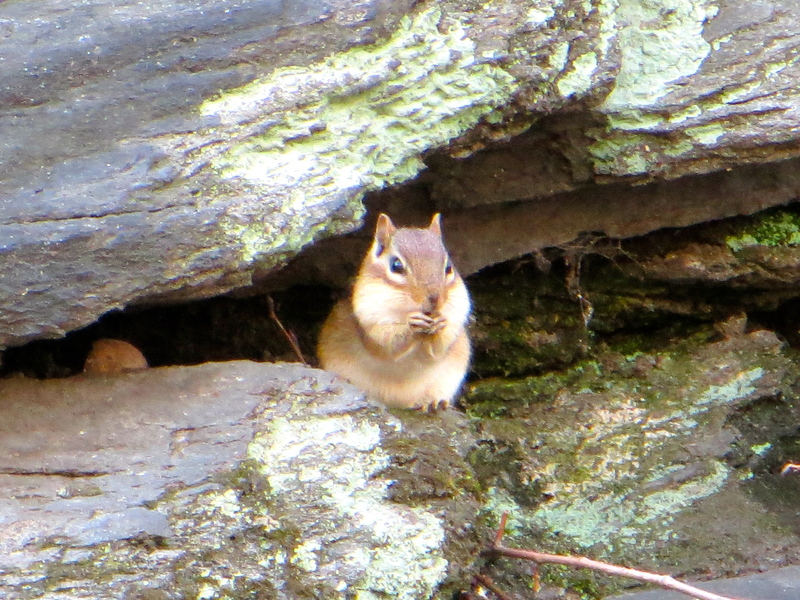 The Eastern chipmunk lives in many of the city’s larger forested parks, but until recently, Central Park was a chipmunk-free zone. 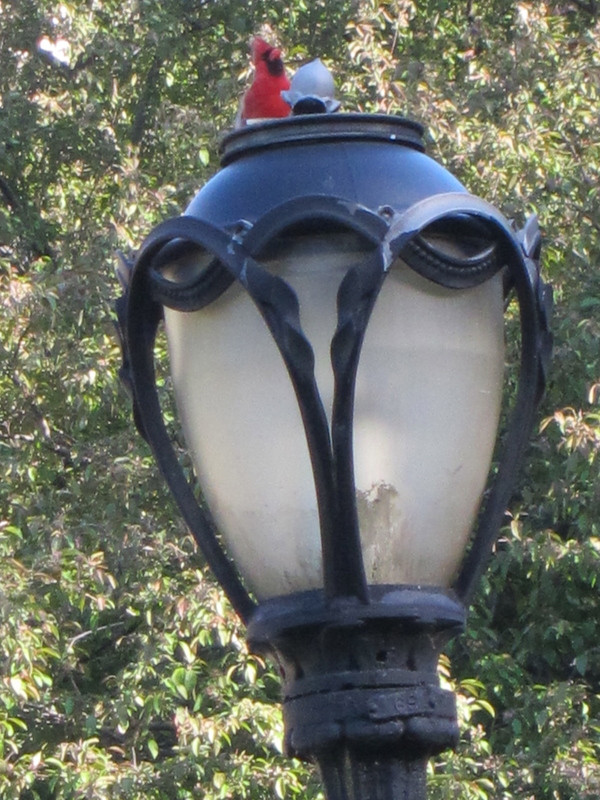 According to the Central Park Conservancy, the return of chipmunks can be traced to a decision in 2009 to remove trash cans from the Park’s woodland areas. The trash had served as a prime food source for the Park’s many rats. 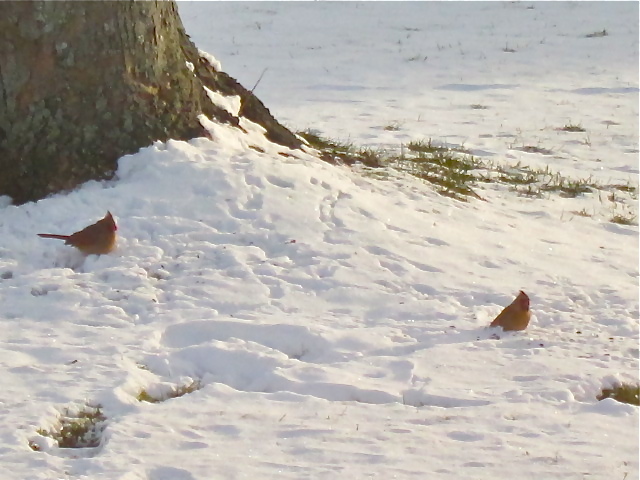 When the trash cans were removed, the trash diminished, and the rats left the Park in search of easier pickings. 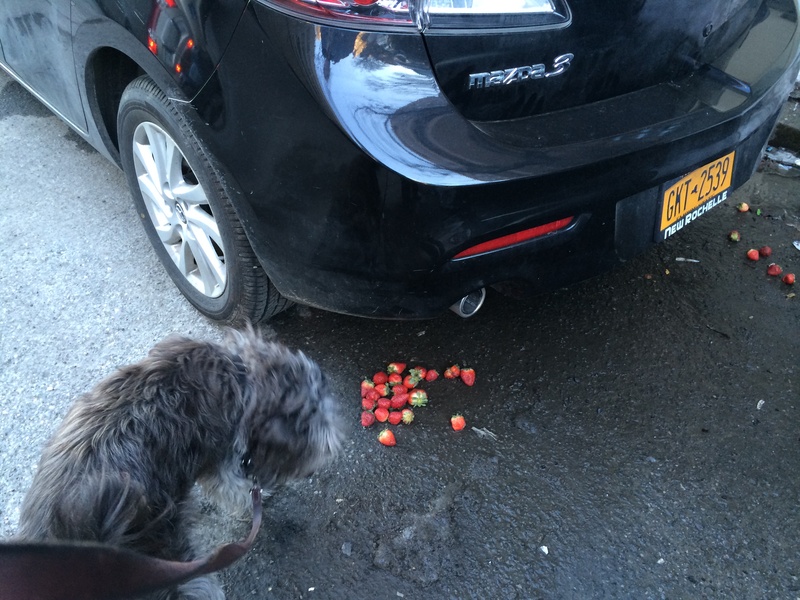 (Sadly, NYC’s system of leaving mountains of trash bags out on the sidewalk overnight means that pretty much any city street on trash night provides a self-service rat buffet.) Apparently, the rat exodus has created favorable conditions for chipmunks to move in and thrive. Whether the rats out-competed the chipmunks for food, preyed on them, or just generated general forest anxiety among smaller creatures, I don’t know. Anyone? 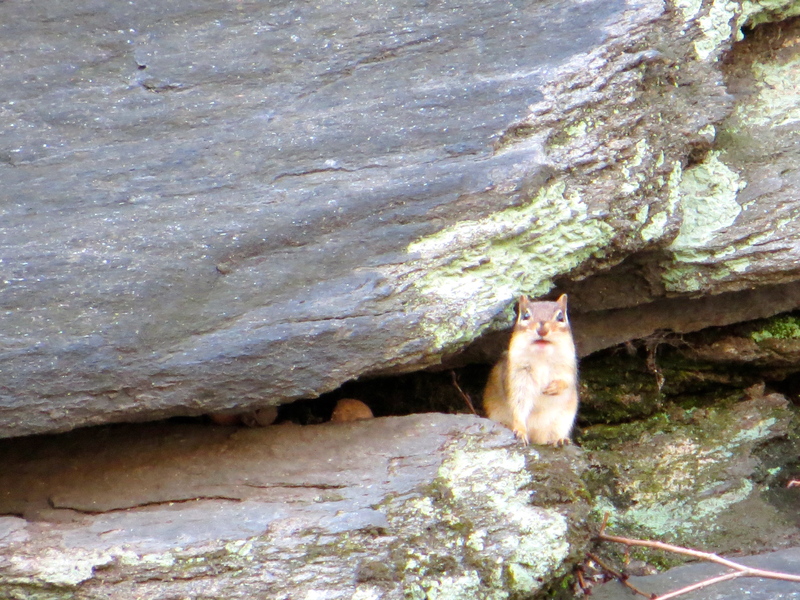 On Sunday, I was thrilled with my first sighting of a Central Park chipmunk. 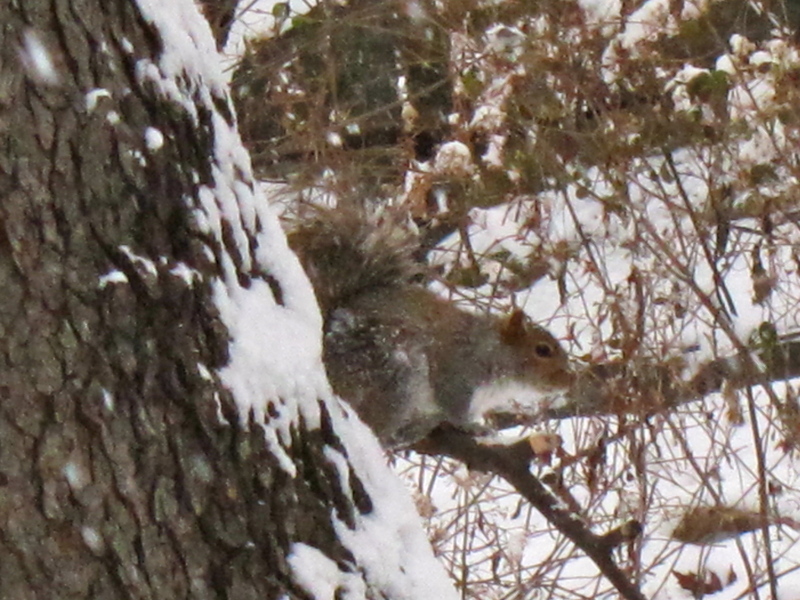 Now that the little rodents have awakened from hibernation with the warming spring temperatures, I hope to see them more often. Eastern chipmunk gives me the hairy eyeball. 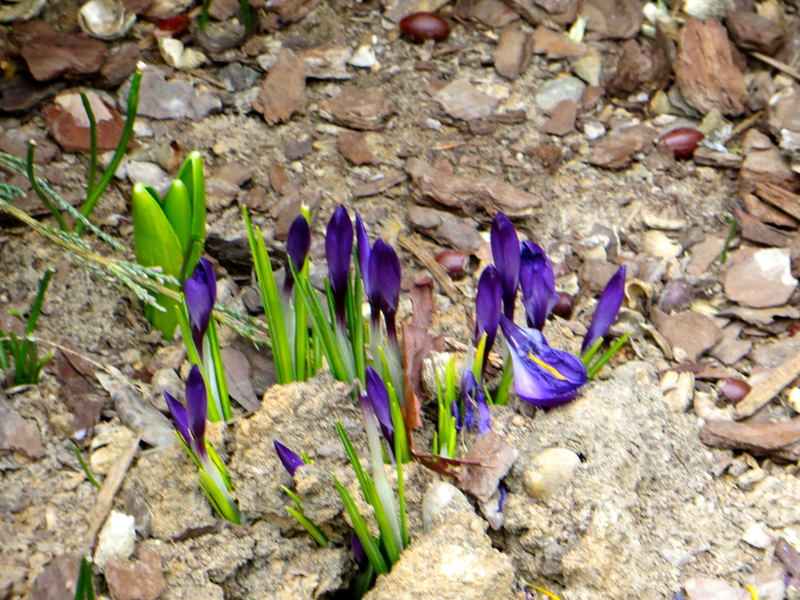 This little fellow ducked repeatedly in and out of its hiding place beneath the rock. 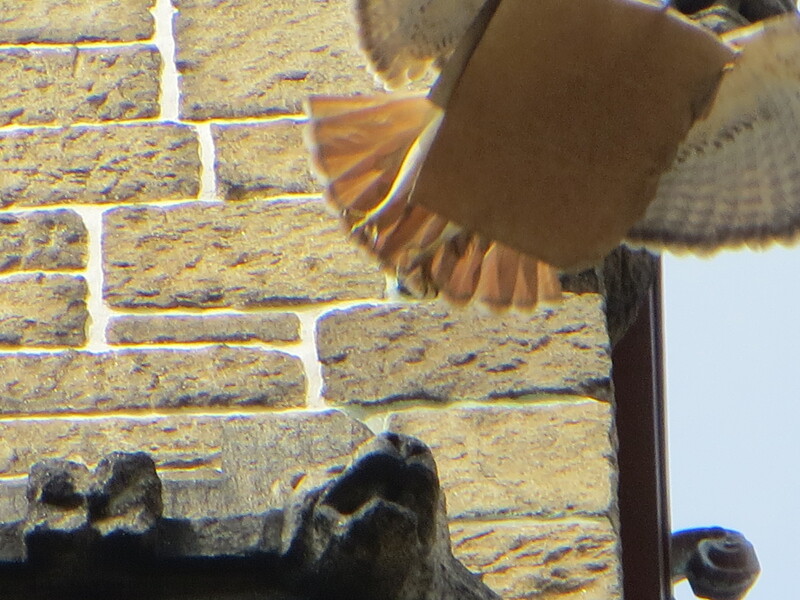 Eventually, though, it rushed off, giving me a good look at its gorgeous back stripes and ruddy rear end before it disappeared into the leaves. 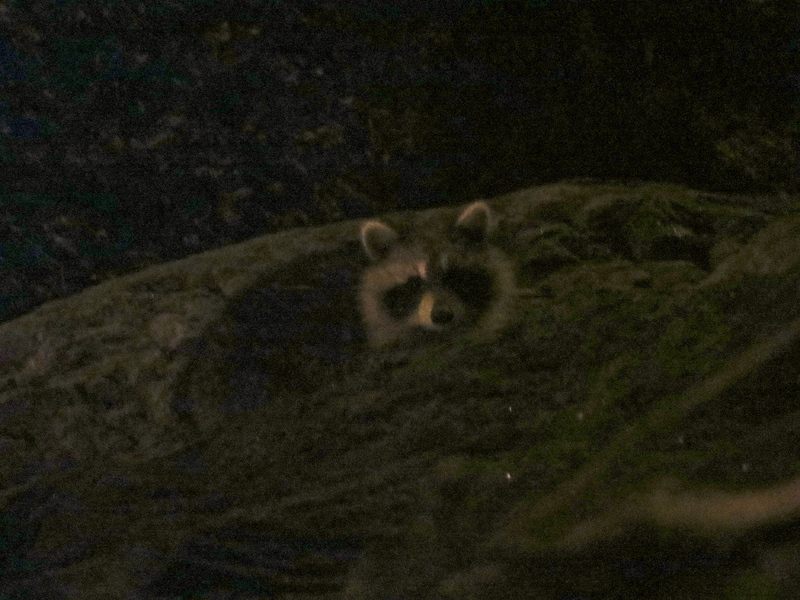 Two nights ago, around nine o’clock, I leaned over the retaining wall at Riverside Park to look for raccoons, and found a raccoon looking right back at me. 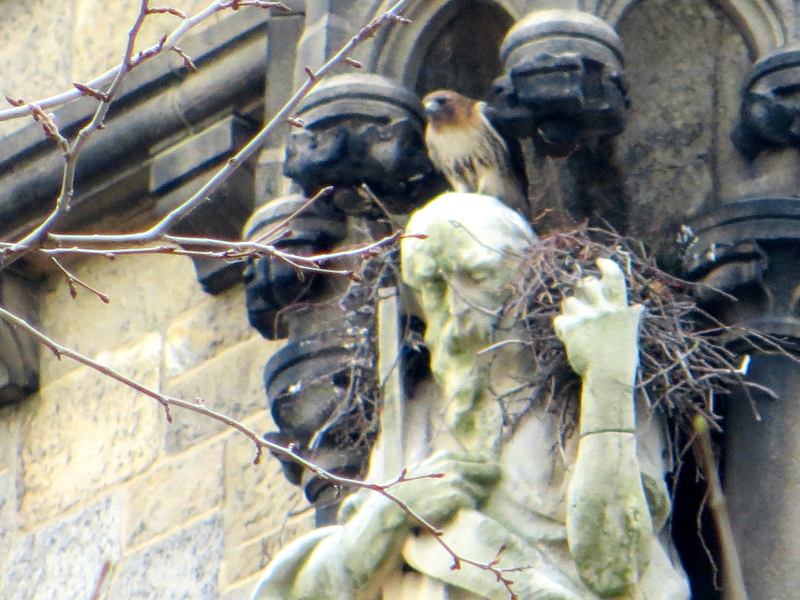 It was perched, as it were, on the broad stone ledge outside its den. 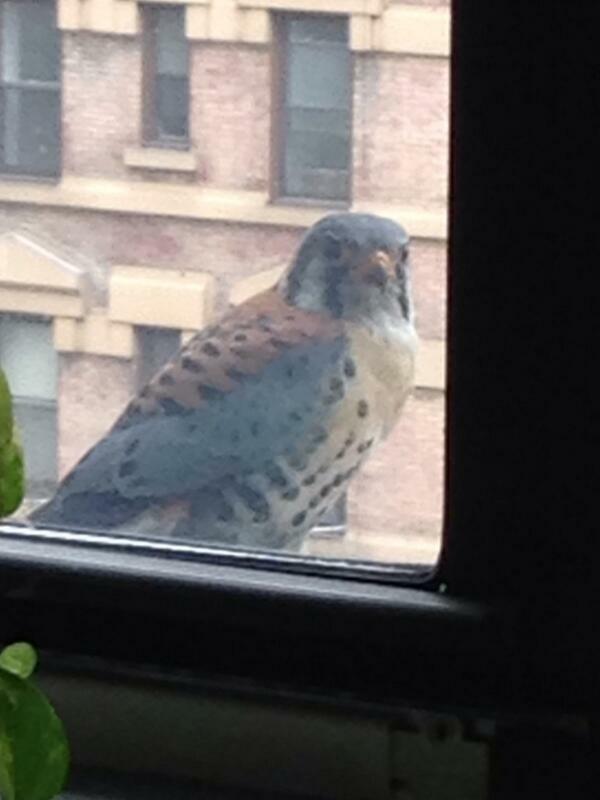 We stared at each other, each apparently curious what the other might do. Neither one of us did much of anything. 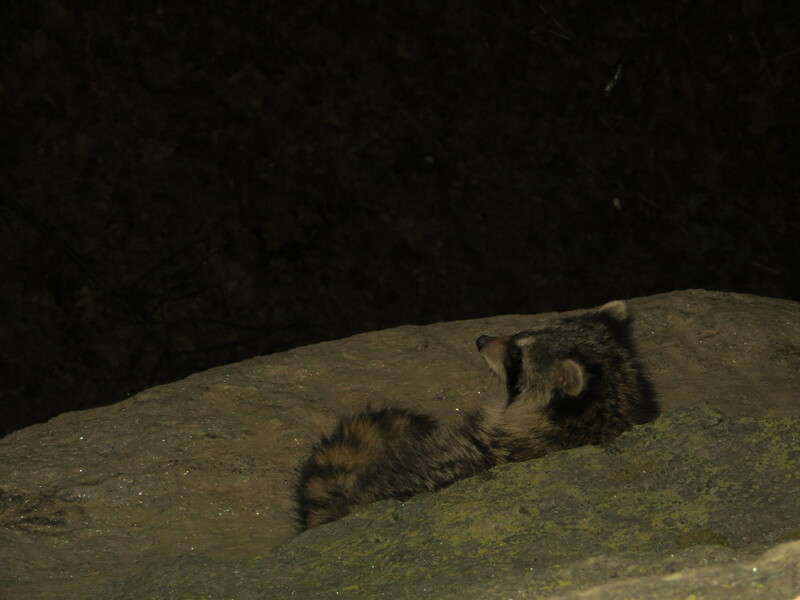 This raccoon and its family members have an ideal den spot with a broad ledge outside that makes it easy for them to loll and relax at the mouth of the hole. When a man and two off-leash dogs came into view on the path below, the raccoon turned its attention away from me to watch the newcomers. The man was talking on his cell phone and kicking a ball for his rambunctious long-legged black mutt to chase, while a slow, imperturbable pug brought up the rear. Neither man nor dogs noticed the raccoon high above their heads, watching their every move. 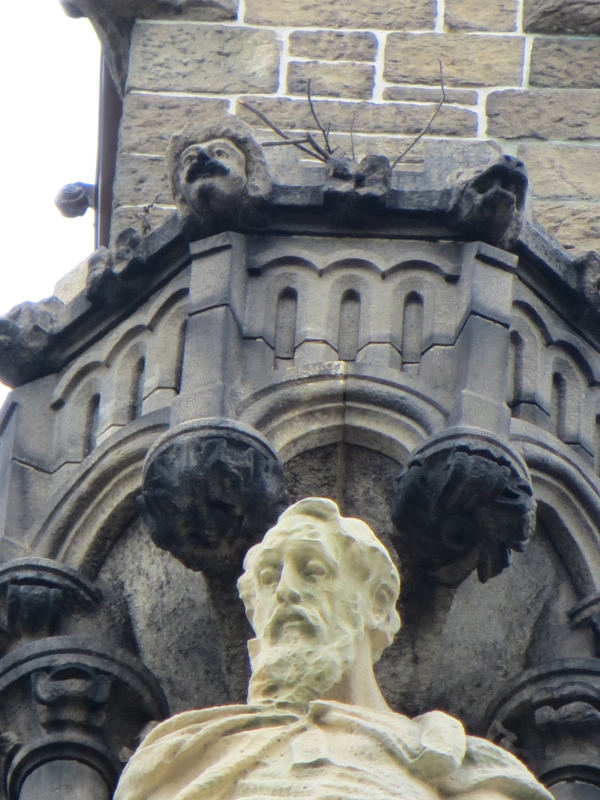 Nor did they notice this human, even higher above their heads, also watching every move. 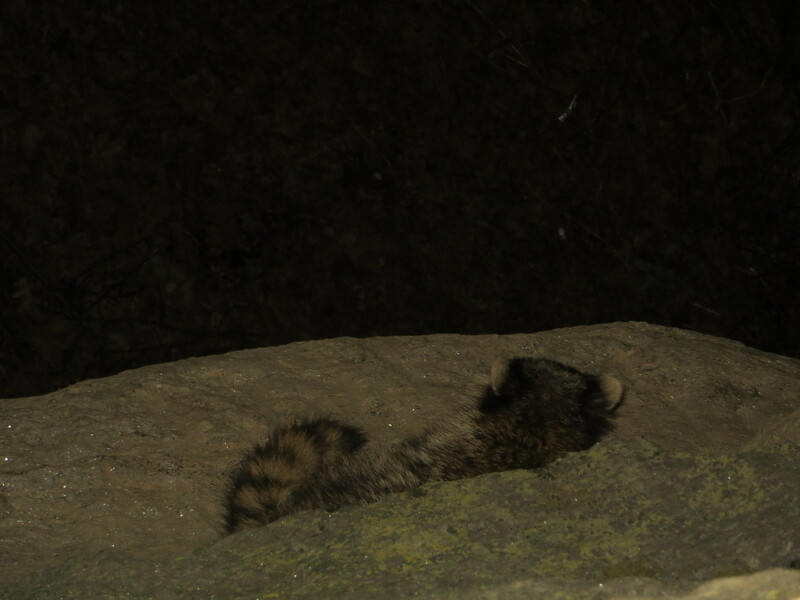 As it watched, the raccoon curled partway into its hole. 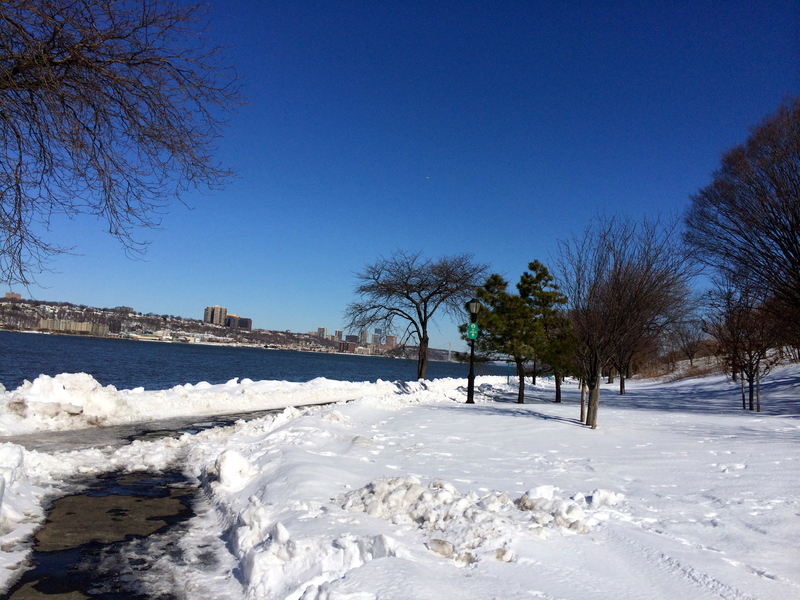 We left it there, the dog and I, and continued our walk along the Riverside Drive promenade. 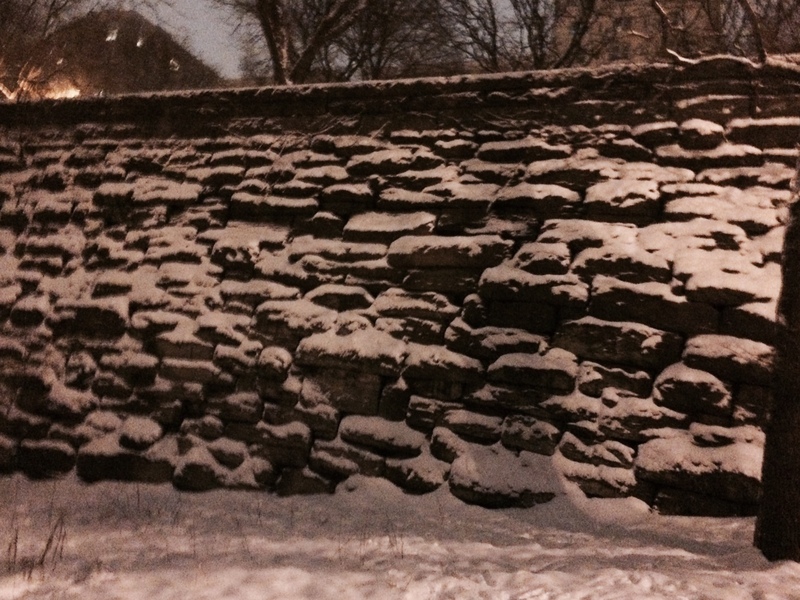 On our way back, I again leaned over the wall. But the raccoon was gone. 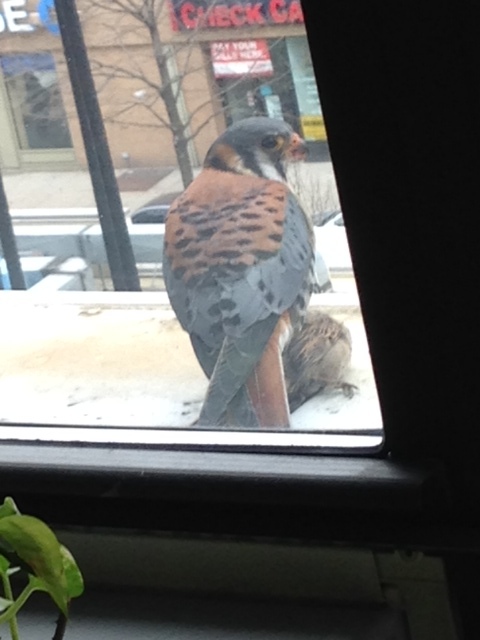 It had probably ducked back into its den. In my admittedly limited and unscientific observations, the Riverside raccoons are slow to actually leave the den for their evening forays into the park. 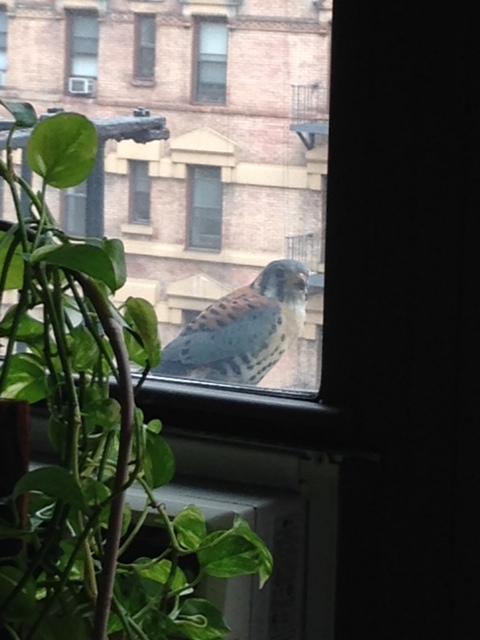 They tend to hang out on the ledge for quite some time, singly or in twos, threes or even fours. They look around and sniff the air, occasionally ducking back into the den as if suddenly remembering they’d left the stove on. Sometimes, when the weather is pleasant, a raccoon will groom itself or a mother will groom a kit, although I haven’t seen any grooming behaviors yet this season. I can’t even say how many raccoons are living in the den this year. 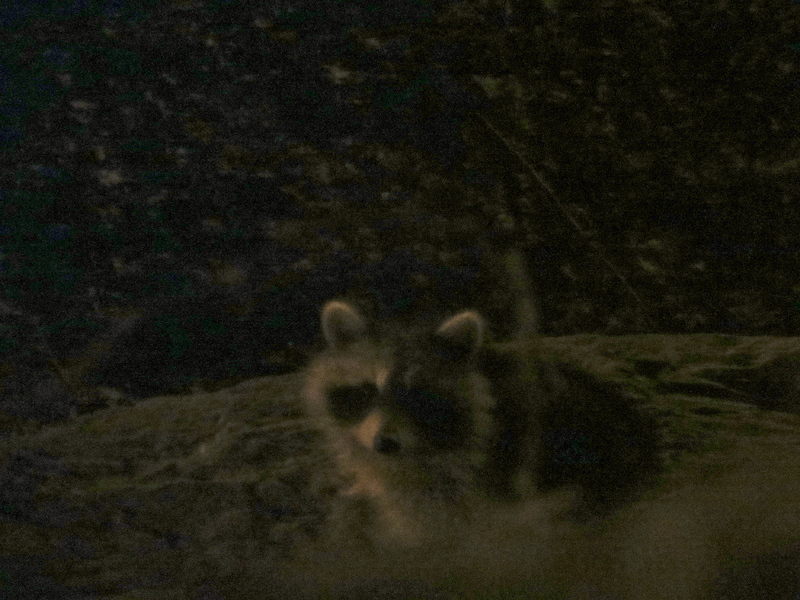 Eventually, though, one or another of the raccoons will leave the ledge and start making its way north along the wall. 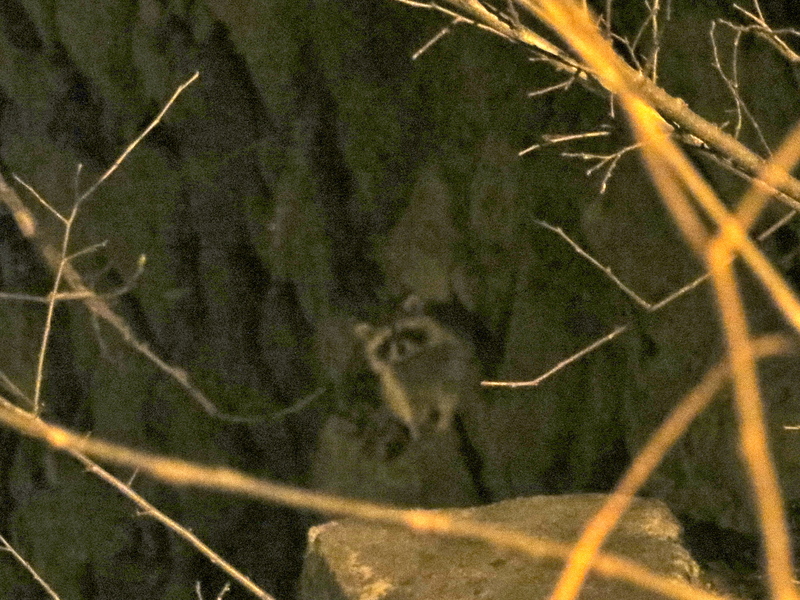 Only rarely do I see one heading south from the den, probably because the grand stone staircase quickly breaks up the wall, so that the raccoon would have to come down to the ground right at a spot that is well traveled by humans and dogs. 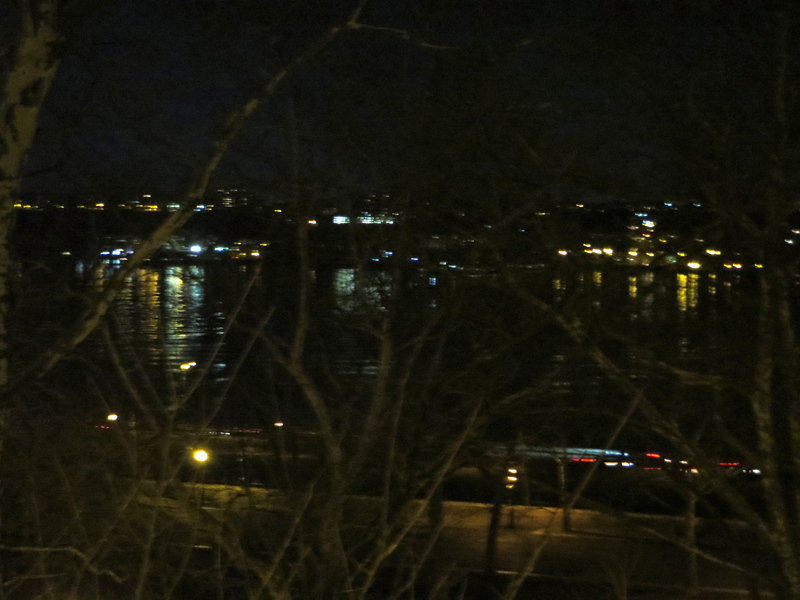 Here is the view from just above the den of Riverside Park, the Hudson River and New Jersey. Not bad. 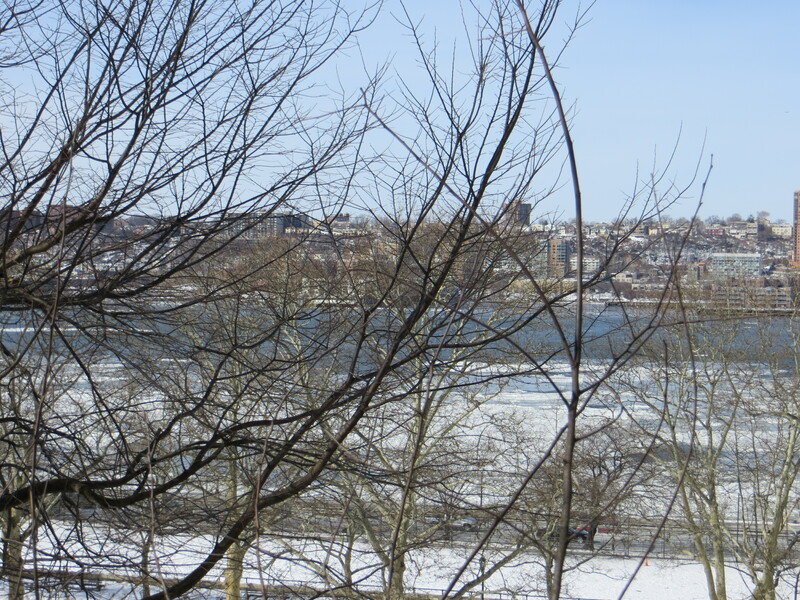 You might linger at the mouth of your den, too, if you had this view to look at. 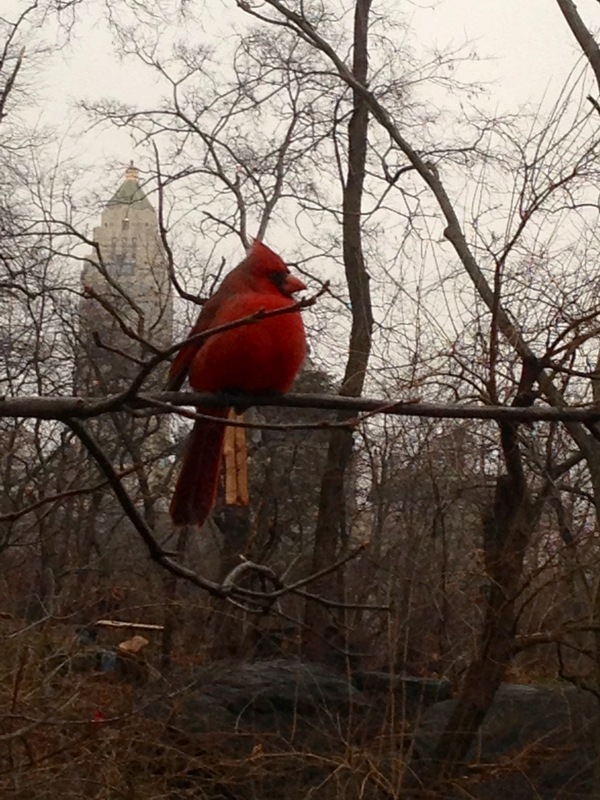 New York City’s three Cathedral peacocks have already begun their annual spring courtship displays in which they unfurl their insanely long, dazzling tail feathers, hold them up in a giant fan, and rotate slowly to enchant the ladies. 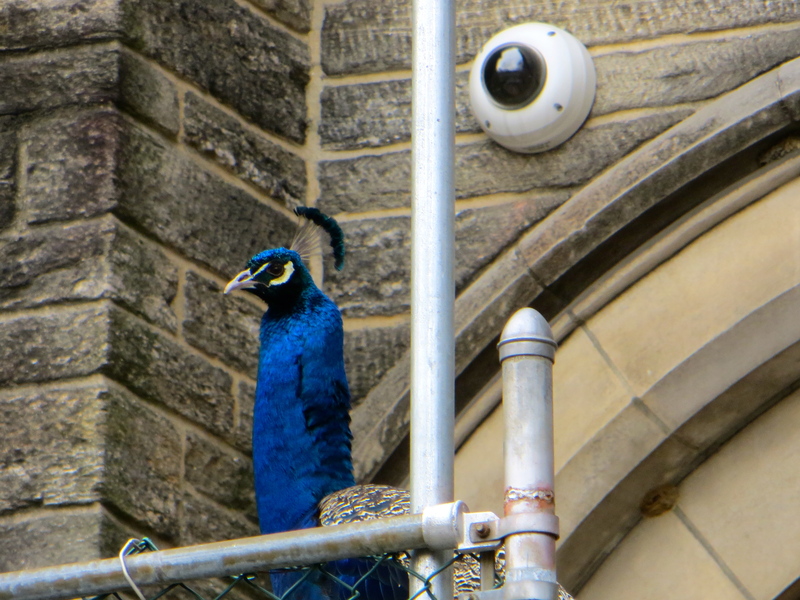 Here is a video I took a few years ago of one of St John the Divine’s peacocks in fine form. 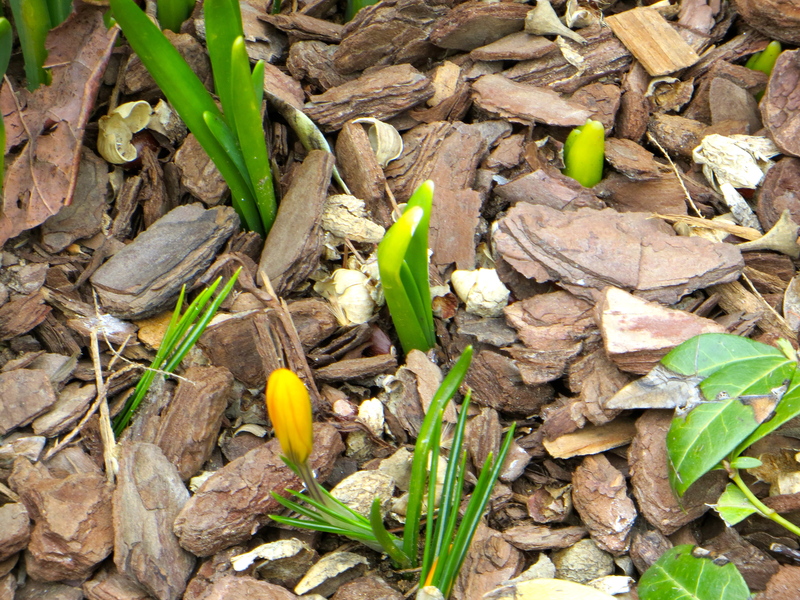 The boys will be displaying like this all spring and summer, but who do they hope to woo? The nearest peahen is several miles away at the Central Park Zoo or the Bronx Zoo (from which one of the pealadies briefly escaped in 2011). Still the peacock boys display to anyone and no one. Yesterday, the white peacock was showing his tail in front of the shed that serves as their roost, while one of the blue peacocks stood alone at the end of the steep driveway, just a few feet from Morningside Drive, with his tail in full sail. Tails furled or unfurled, peacocks seem to have an innate design sense. 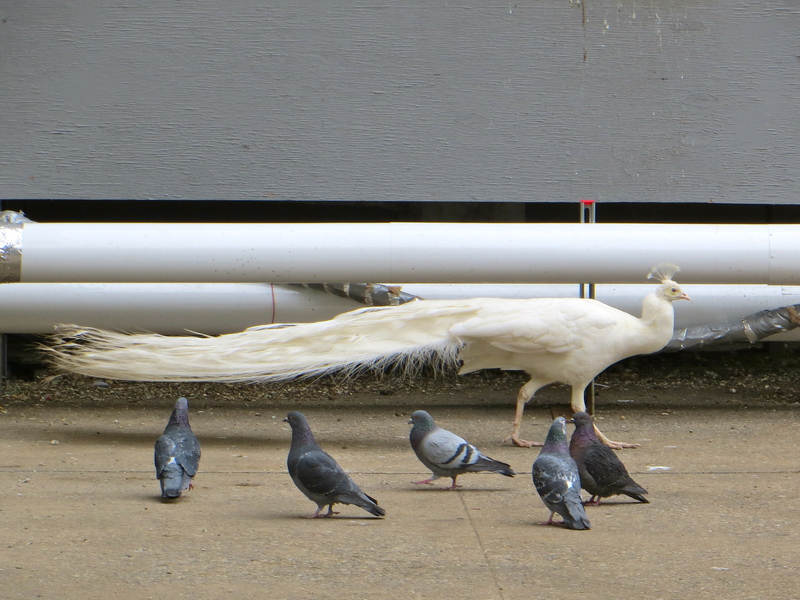 Here the white peacock displays a striking horizontal elegance. 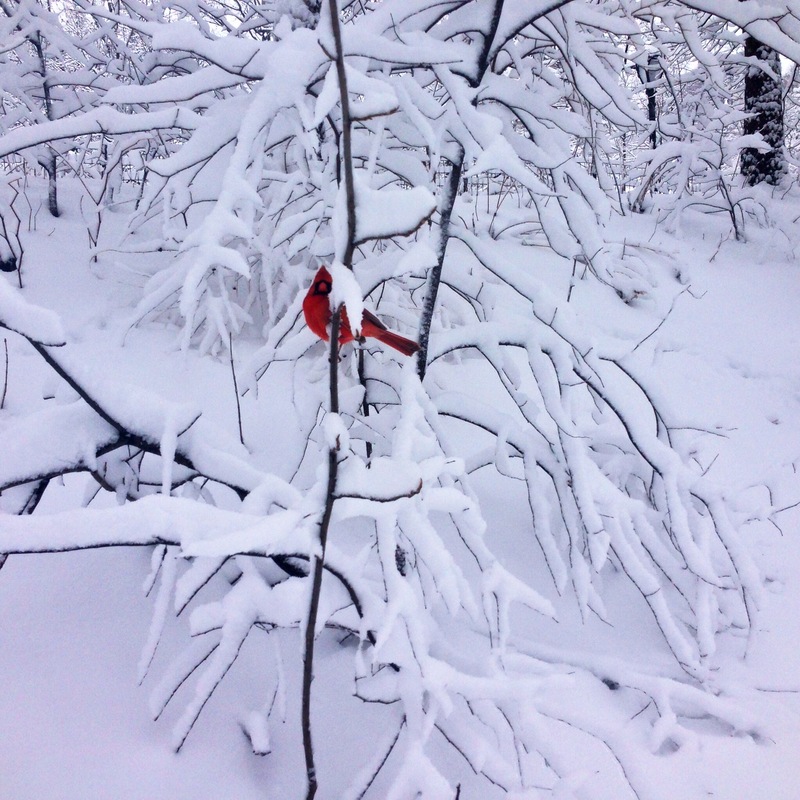 Down the driveway, his friend advocates for the power and beauty of the vertical. 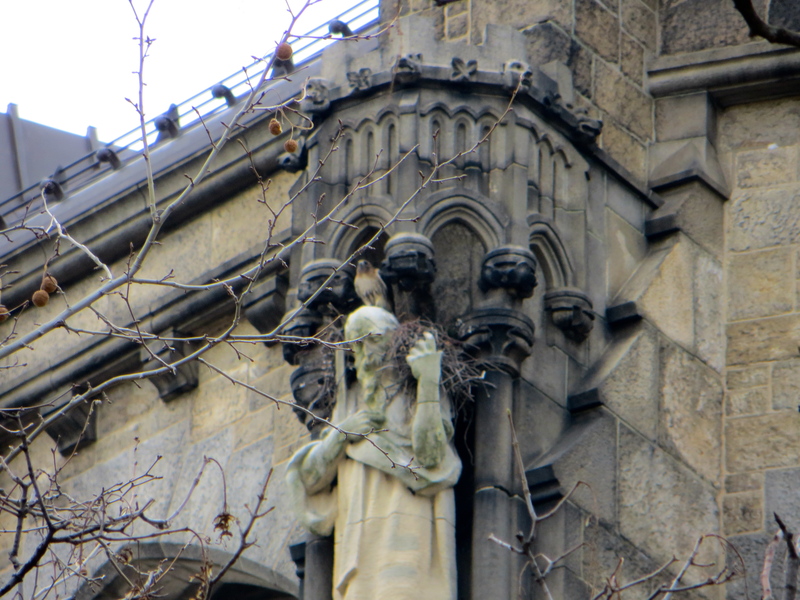 For more on the Cathedral peacocks, stay tuned. Or visit our archives.